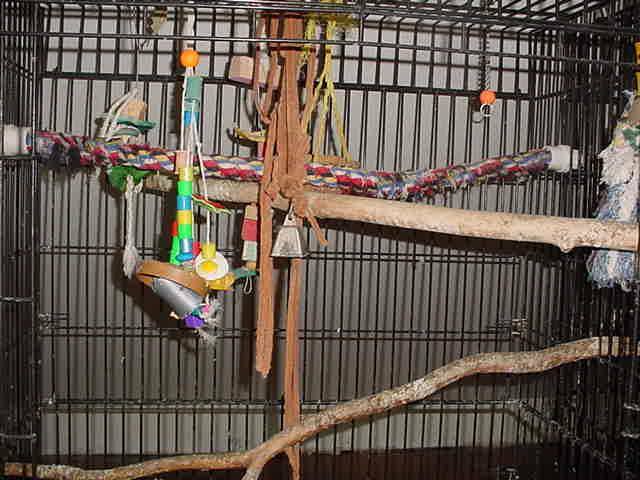 If your cage has any dowels in it, throw them away. They will give your bird the avian equivalent of carpal tunnel syndrome. NO bird wants to sit on a dowel. Get natural branches. most native woods in the US are safe to use...avoid oak, cedar, and redwood. I like to use willow, dogwood, maple, and pine. If you have access to a hunseysuckle bush hedge, the branches are excellent. Apple is good too...the birds like the bark. in most caes you can install them by just jamming them between the bars. I also like the rope perches made by people like Booda a lot...soft underfoot, and easily attached. I especially always want one in the highest back corner where the bird will want to sleep. Keep them trimmed of long loose threads. I don't use the cement perches. For every bird I've seen with neatly trimmed claws, I've seen four with sore pads from those things. There's a guy in IL called Bird On The Rocks who makes perches out of ledges of limestone...my conures and amazons love them. Remember that your bird should have a variety of sizes, from a full wrap to standing flat-footed.